This contribution seeks to better understand undergraduate students’ perceptions of and engagement in a virtual resource center for Business English and the links between the use of the center and English language learning. In order to assess student engagement in the virtual resource center, we have conducted a representative questionnaire study. The results show that there is a complex relationship between perceptions and actions and that even when students claim to perceive tools as relevant this does not necessarily lead to increased engagement. These results bring us back to the drawing board to discuss how we can encourage students to take the next step and spend more time using the resources available to them in order to increase their investment in individualized English language learning opportunities online. Cet article cherche à mieux comprendre l’investissement des étudiants d’anglais en licence LEA dans un centre de ressources virtuel ainsi que leurs perceptions du centre et les liens entre l'utilisation de celui-ci et l'apprentissage de l'anglais. Afin d'étudier l'engagement des utilisateurs dans le dispositif, nous avons effectué une enquête représentative par questionnaire. Les résultats montrent que la relation entre les représentations construites et les actions des étudiants sont complexes. Percevoir un outil comme étant utile pour améliorer ses compétences en langues ne se traduit pas systématiquement par une utilisation accrue du dit-outil. Les résultats nous encouragent à nous concentrer sur les développements futurs du centre et sur la manière d'encourager les étudiants à s'en servir davantage afin d'augmenter leur investissement dans l'apprentissage de l'anglais en ligne. 1The virtual resource center which will be assessed in this contribution was set up as an integral component of a blended task-based syllabus that has been implemented as a response to problems detected in the Foreign Languages and International Trade program (Langues étrangères appliquées, LEA) at the University of Nantes. As highlighted in past publications (Narcy-Combes, M.-F. 2011; McAllister et al. 2012), language classes, especially English, which are mandatory for all students in this particular program, have from 45 to 60 students per class and student proficiency levels are heterogeneous, which makes it necessary but difficult for teachers to provide individualized feedback. In addition, overcrowded classrooms give students few opportunities to practice, especially within the framework of a traditional teacher-centered environment. Within this context, it has been noted that student drop-out rates are over 45% at the end of the first year. 2Implementing a blended learning task-based syllabus which includes a virtual resource center has been a way to increase students' cognitive investment in English language learning outside the formal classroom setting, encourage students' active participation in class, and provide them with opportunities to work on their individual language problems independently. 3Using an action-research protocol, several angles of the overall program have been evaluated, including students' language learning and appropriation of the system (Buck & McAllister 2011; McAllister 2013; Narcy-Combes, M.-F. & McAllister 2011) as well as teachers' adoption of both the computer-mediated and task-based elements of the program (Starkey-Perret et al. 2012; McAllister et al. 2012). This contribution will thus focus on one element of the program which has not yet been fully evaluated: the virtual resource center (VRC). 4The present study investigates learners’ declared engagement in the VRC and the representations they have constructed about its usefulness for language learning as measured by a questionnaire. The questionnaire results are then linked to measures of their language progress and to notions of academic success and failure. The results of an analysis of student written productions as well as student interactions in the face-to-face settings and their relation to the VRC will be highlighted. 5Before presenting the detailed results of the questionnaire study and the analysis of learning outcomes, we will briefly describe the task-based syllabus that has been implemented in the Business English course, how the VRC was designed as an integral component of this syllabus and precisely what it consists of, as well as its theoretical underpinnings. We will also discuss the methodology used to set up and distribute our questionnaire and to analyze the results. After presenting the results we will discuss the limits of our study and how we plan to further develop and promote the resource center to encourage students to seize the online opportunities we have provided. 6Depending on the semester, the blended learning program combines 2 hours of face-to-face teaching with 2 to 4 hours of group and individual computer-mediated work per week. The latter is an estimate of how many hours the students need to complete the course work outside of class time. The actual time spent depends on the individual learners and/or the working groups. 7Although teachers are given a lot of freedom within the program, the face-to-face time spent with students generally includes macro-task performance (oral presentations, role-plays, for example) and other interactive activities, vocabulary or skills-based focus, translation activities, feedback and/or focus on form (see Buck & McAllister 2011; McAllister et al 2012 for further description of the macro-tasks). a space reserved for the VRC, which contains interactive grammar, vocabulary, and listening exercises to help students work on the morphosyntactic, phonetic, and lexical areas they have most difficulty with. These exercises are related to the themes studied in the Business English curriculum. 9Outside of the classroom, students work on 4 to 8 macro-tasks during a twelve-week semester, depending on the course. The macro-tasks are presented as real-life business scenarios (Buck-Roots 2005), are designed to be student-centered, involve collaborative learning and problem solving and focus on meaning and authenticity (McAllister et al 2012). After the written or oral production of the macro-tasks, teachers provide feedback to address individual differences and focus on forms. Learners are then encouraged to log on to the VRC, which is the element of the program we will focus on here. 10The VRC contains over 200 activities (micro-tasks) which we organized into the following categories: listening, vocabulary, grammar, pronunciation and useful websites. Students can also use the search engine to find exercises by typing in key words. Furthermore, they have access to a repertoire of contextualized explanations of various morphosyntactic structures under the heading "Grammar explanations". The grammar points are linked to practice exercises so that the students can go back and forth from declarative metalinguistic knowledge to practice which is meant to help language associations become more automatic (Ur 2004:19). 11A total of 1415 undergraduate students had access to the virtual resource center at the time the questionnaire study was carried out. Even though teachers send their students to the VRC for troubleshooting purposes, the students are not under obligation to participate in the activities available to them1. 12It seems necessary to specify that our blended, task-based syllabus was designed by drawing from Second Language Acquisition (SLA) literature (Bygate, Skehan & Swain 2001; Ellis, R 2003; Willis & Willis 2007; Willis 2009). It is based on Task-Based Language Learning and Teaching (TBLT) combining macro-tasks (social tasks) (Narcy-Combes J.-P. 2005) which foster interaction and co-construction of language skills (Bruner, 2000) and individual tasks for meta-reflection and practice (Bertin & Narcy-Combes 2012; Bertin, Gravé, & Narcy-Combes 2010). further opportunities for noticing structures through focused input and controlled practice (Schmidt 2001). 14Theoretical validity from an acquisitional standpoint is not sufficient to motivate learners to engage in individual learning tasks. Individuals' beliefs and representations are predispositions to action (Moscovici 1961; Rokeach 1968) and it is held that students' perceptions of the center will greatly impact their use of the technology at hand and consequently, the effectiveness of the (e)-learning environment (Schutz & Pekrun 2007). The pedagogical team therefore deemed it necessary to investigate the social validity of the resource center, that is to say, if our developments are acceptable, relevant and useful for students involved in the program (Wolf 1978). Assessing the social validity of the VRC will enable us to make necessary adjustments to encourage students to further their engagement in language learning opportunities outside of the classroom. 15As language teachers in the university system, we are confronted with two sometimes seemingly opposing definitions of success. Success in English language learning can simply mean that a learner has, over the course of a semester or year, mastered the present perfect, or, progressed from a B1 level to a B2 level as defined by the Common European Framework of Reference (CEFR) (Council of Europe 2001). However, this highly individualized success does not always translate to success in the university system. 16Previous research using pre and post-tests to evaluate the impact of the overall blended, task-based program on language acquisition have shown positive results (see Buck & McAllister 2011 & Narcy-Combes, M.-F & McAllister 2011). However, the task-based program has not been able to single handedly change student failure and drop-out rates in the LEA program. The lack of impact of the program on general student success and failure rates can be explained by the probability that the business English course is not the only reason that some students change their mind about their choice to enroll in LEA or do not pass their first year of University. Furthermore, the pre-tests showed that whereas students are expected to have a B2 level at the beginning of their pre-graduate studies, a majority of our students enter university at the B1 level (Buck & McAllister 2011; Narcy-Combes, M.-F. & McAllister 2011). Since the tasks and exams are set at a B2 level, those who have a B1 or lower are not likely to succeed, even if they have made progress in their language skills over the academic year. 17Given the low impact of the overall program on academic success, we have not sought to measure the impact of using the VRC on students’ academic success and we note that the drop out and failure rates remain constant. 18As the goal of this research is to explore student engagement in the VRC and the links between their perceptions and learning outcomes in order to give clear direction to our future developments, our research questions are as follows. 19RQ1: Do the students engage in the activities on the VRC? RQ2: Do they perceive the activities as useful for their language learning? RQ3: Does using the VRC foster language acquisition? 20Our hypothesis is that if students perceive the activities as useful for learning English, then they will engage in the virtual resource center. This in turn should foster learning. 21In order to answer our research questions, we have conducted a questionnaire study. The questions are formulated based on our research questions and based on preliminary interview and questionnaire data (see McAllister 2013). The questionnaire (see appendix 1) was created with and analyzed by the software Sphinx. It is comprised of 35 items, held on 2 pages. The questions are primarily closed. There are, however, 5 open questions (items 2, 5, 7, 11 & 32). 22Although the Sphinx software offers an online version of the questionnaire, a print version was used. We asked the teachers in the program to distribute and to collect the questionnaire in their classes in order to increase the number of respondents. 23In this section we will present the findings regarding the students' profiles (year of study, age and gender), their declared use of the center and of other technology to enhance their English language learning, their declared usage and evaluation of the usefulness of the various activities found in the virtual resource center and their evaluation of the quality of various aspects of the center. We will then focus on learning outcomes by presenting the perceptions students have of learning with the VRC (items 29-32). This will open up to discussion of the differences between perceived learning outcomes and actual, measurable learning outcomes, as well as the differences between success and failure in language learning and actual academic success and failure. 24In all, 661 undergraduate (years 1 to 3) students responded to the questionnaire. The majority of the respondents are 1st year students with a decreasing number of respondents per undergraduate year. This is representative of the distribution of the student body at the University of Nantes due to drop out/ failure rates (see McAllister et al 2012). 73% of the respondents are female and a large majority (73%) is aged 18 to 20, which is also representative of the gender and age distribution in the present student body (McAllister 2013). 25In spite of a generally positive attitude to technology use (see figure 1), 52% of the students declared not to have used the virtual resource center (48% claimed to have used it). The main reasons given for not using the center are because it doesn't occur to them (32%), they prefer to concentrate on the required course work (17%) and lack of time (13%). For those who do use the center, the main reasons given were that their teacher advised them to do so during class (25%), in order to prepare for the macrotasks (19%) and to study for exams (15%). 26Of those who use the platform, 66% declare to have used it between 1 and 3 times. 19% of users say they have used the center 4 to 5 times, 4% have used it 6 to 7 times, 4% over 8 times and 7% claim to have used it every week during the semester. Out of these same respondents, 58% claim to spend less than 30 minutes on the center for each visit, and 35% from 30 minutes to one hour. 27We asked the respondents to give us feedback on how they perceived the usefulness of the activities found in the different sections of the VRC: Listening, Vocabulary, Grammar, Pronunciation, Useful Websites and Grammar explanations. 28Of the 373 responses to the question "Among the activities found on the Virtual Resource Center, I used the Listening exercises…", 215 claim never to have done any of the listening exercises in the center. However, 103 of these same respondents give an opinion on the usefulness of this section (Table 1), hence the necessity to consider the data resulting from this analysis with precaution. A chi-square test of independence was performed to examine the relation between frequency of use and perception of usefulness of the VRC. The relation between these variables was statistically significant (p <0.01). Table 1 shows that the higher the rate of use of this section (‘sometimes’, ‘often’ and ‘very often’), the more positively it is evaluated by those users. However, these responses concern only 54 of the total sample (661 respondents) which limits the interpretative value of these results. Table 1: Cross tabulation of the frequency of use of the listening exercises and their perceived usefulness. 29Chi2 = 43.76, df = 12, p <0.01. 30More respondents tend to use the vocabulary exercises in the center compared to the listening exercises (figure 3). 31Just as for the listening section, we can see that 7 of those who did not answer the question concerning the use of the vocabulary exercises and 56 of the 118 who claim not to use it, still give an opinion on the usefulness of the vocabulary section (Table 2). Likewise, the more it is used, the more it is perceived as being useful (p <0.01). However, only 11 respondents claim to use the section ‘very often’, which limits the interpretive value of our findings. Table 2: Cross tabulation of the frequency of use of the Vocabulary exercises and their perceived usefulness. 32Chi2 = 46.77, df = 12, p <0.01. 33The same tendencies can be found for the Grammar section of the VRC. Of the 370 responses, 123 have never been to the grammar activities, 145 claim to use them rarely, 62 sometimes, 33 often and 7 very often. Nearly half of those who claim to never have used this section express an opinion on its usefulness and for 41 of those 61 respondents, this opinion is positive. Once again, those who use it more, find it more useful for language learning (p <0.01). 34Fewer respondents use the activities in the pronunciation section of the VRC than in the other sections discussed thus far (137 have used it, from ‘rarely’ to ‘very often’). 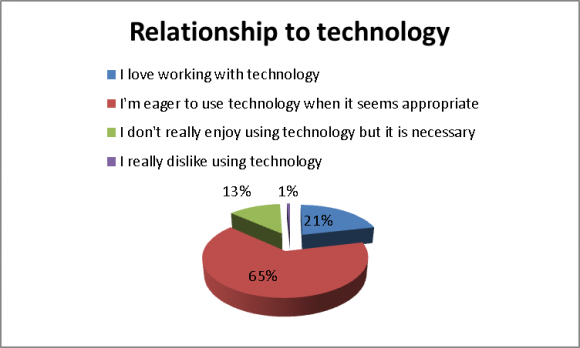 It is interesting to note that although there were fewer users, the respondents still had the same attitude towards the tools provided. 117 of the 241 respondents who claim never to have used the pronunciation section express an opinion on its usefulness for their language learning, of which the majority perceives it as being useful. The same phenomenon can be noted as for the other sections, a higher rate of use corresponds to a more positive perception of the section (p <0.01). However, the interpretive value of these results is limited as only 5 respondents claim to use this section regularly. 35The same tendencies can be observed in the Web links section of the VRC. It is rarely used (99 ‘rarely’, 40 ‘sometimes’, 21 ‘often’ and 4 ‘very often’), however, 108 of the 207 respondents who claim not to use the web links talk about its usefulness, 63 of whom (more than half) find the section to be useful. The more this section is used, the more it is perceived as useful. 36The results of the most recent section of our VRC, the grammar explanations, are similar to the findings for the other sections. This section had been added after preliminary research had shown a need for it (McAllister, 2013). The same phenomena can be observed here as for the other sections. However, it is more frequently used than the web-links and the pronunciation activities. 37These results allow us to answer research questions 1 and 2. Do the students engage in the activities on the VRC (RQ1)? All of the resources remain underexploited by the respondents and only a minority of students claim to use the VRC on a regular basis. A previous analysis of actual connections to the Moodle platform corroborates this: 40% of the students registered on the system never used it; of those students who did use it (60%), almost two-thirds used it on an infrequent basis accessing it fewer than 5 times during the semester with only 4% of students using it on a regular weekly basis (12+ connections during the semester) (McAllister 2013). Do the students perceive the activities as useful for their language learning (RQ2)? Globally, the various sections of the virtual resource center are judged positively by those who use them and even by a significant portion of those who have never used them at all. The questionnaire data has enabled us to bring to light a paradox in which students perceive resources as useful but do not actually them. How we intend to address this paradox will be further developed in the discussion session. 38Beyond perceptions of usefulness for language learning, respondents were asked to rate their satisfaction with various aspects of the center on a scale from 1 (extremely dissatisfied) to 5 (highly satisfied). The results show overall satisfaction with the variety of activities, the ergonomics of the center, the clarity of the grammar explanations, the themes chosen and the quality of feedback given. It is in this context that students rated the extent to which they felt they had progressed in various aspects of English on a scale from 1 (not at all) to 4 (yes, quite a lot). 39Only the responses of students who have used the VRC have been analyzed. The results show that they felt they had progressed more in terms of grammar mastery (2.5/4) and vocabulary (2.6/4) than they did in listening comprehension (2.2/4) and in pronunciation (2.1/4). In percentage terms this equates to 53% of respondents feeling that they had progressed in terms of grammar mastery and 62% for vocabulary. The grammar and vocabulary sections also correspond to the sections more used by the respondents hence confirming a virtuous cycle by which the more they use a section, the more they perceive it as useful for learning and the more they are convinced that they did indeed learn more. 40Pre and post tests in the form of a written production used to evaluate the impact of the overall blended, task-based syllabus, which includes the VRC, have shown positive tendencies in terms of language acquisition (see Buck & McAllister 2011; McAllister 2013; Narcy-Combes, M.-F. & McAlister 2011). Specifically, the results show a positive evolution concerning language performance for a third of the students participating in the blended learning program. This measured outcome is significantly lower than the perceived one, if we consider the percentages above. 41Our analysis of the pre-tests show that just over a quarter of the students have a B2 to C1 level. The majority of first year students have a B1 level (47%) and some have A2 (27%). This is an important point because our findings indicate that the most significant improvement in language performance concerned students at the B1 level who evolved to B2 between the pre and post test. Furthermore, our analysis of the content of a sample of students' written productions show that fluency and accuracy developed for those students who had already attained the B1 level, while only fluency and lexical complexity developed for those who had improved from A2 to B1 (McAllister 2013). That is to say that the measurable learning outcomes varied according to the proficiency level of the student at the outset with those at the B1 level benefitting the most from our overall blended learning program. 42The question, then, was to examine the link between the students’ progression from the pre-test to the post-test and the actual usage of the VRC. We did this on the basis of usage data collected from the Moodle activity logs and we performed a chi-square test of independence. The cross tabulation results indicate no statistically significant relation between the two variables (p=0.45). In other words, students who progressed between the pre-test and the post-test did not use the VRC more than those who did not progress. In both cases the overwhelming majority of students (91%) accessed the VRC on an occasional basis carrying out fewer than 100 actions2, which equates to insufficient repetition to have an impact on language acquisition. Furthermore, among this group of occasional users 14% adopted a passive behaviour whereby they simply viewed pages on the VRC, but did not actually complete any exercises. It would appear from these results that the VRC had no direct impact on learning outcomes (McAllister 2013). for G2: 16 instances of the conditional used correctly by eight out of ten students in the group, 18 instances of “could” or “would” used correctly in a negotiations context. 44Table 3 presents extracts from the corpus highlighting examples of the target structures embedded in the students' (L) interactions (McAllister 2013). Another phenomenon illustrating the influence of the pre-task work on the VRC was the over-generalization of the conditional structure by some students, for example in group 1, L9 employed the target form nine times while another student, L11, used it five times. L8 : We are ready to wait, if you propose a better offer. L1 : We could accept the deal, if eh fourth months is possible. L6 : If you want to cut one of them, my recommendation will be to take off the chat. L2 : … but if if you want to, we can reach an agreement in order to to to to to have a better price. L4 : If you want to make some savings, hmm maybe you could eh think about eh the features. L3 : If you do that , we can maybe do eh also a discount. L6 : We could consider a price under three thousand seventy seven hundred Euros. L7 : So we could also reduce the number of technicians on the helpline. L4 : We could offer to make it in six months. L6: We could discuss it after the estimate. 45Students also recalled target lexical chunks from their pre-task work on the VRC when performing the negotiation role play. Twenty nine instances of chunks were identified for G1 and 34 instances for G2 (McAllister 2013). 46These results would seem to suggest an indirect, qualitative link between the VRC and student performance by highlighting its role in promoting practise, repetition and subsequent recall of target language forms and chunks. However, more research needs to be carried out to verify this link. 47As far as student engagement in the VRC is concerned (RQ1), the results of the present study show that just under half of the respondents stated that they had used the resource center over the course of the semester. Of these, the majority have only used it up to 3 times over the course of the semester and the time spent for each connection is under 30 minutes. Actual usage data derived from activity logs from the platform corroborate these findings. From an acquisitional standpoint, this amount of investment is not enough to foster learning because there is no positive effect of repetition, which is vital to long term memory recall of language structures and chunks (Baddeley 2010; MacWhinney, 2008; Ellis, N. 2001). Our results are similar to other studies which show that student engagement in the resources provided is often much lower than what researchers and teachers had envisioned when developing the resources (Foucher & Andrianirina 2007; Docq & Daele 2003; Fischer 2012). Françoise Docq and Amaury Daele (2003) stress that for resources to be used by students, they must perceive them as being useful to achieve the task at hand. It follows then that resources need to be tightly integrated into overall task objectives. 48Students claim that they do not think of using the resource center, that they prefer to focus on other learning opportunities that they perceive to be more directly linked to the graded course work and that they do not have the time to go on the virtual resource center. For those who do use the center, the main reasons were that their teacher had advised them to, in order to prepare for the macrotasks and to study for exams. Language learning and general progress were not among the most significant reasons for using the center. These results suggest that our respondents do not have very integrative attitudes toward language learning and may lack autonomy and responsibility. This could, in part, explain their low frequency of use of the VRC. It would appear, as per the study by Docq and Daele (2003), that students simply did not see the VRC as being essential to achieving their task objectives. 49In spite of these results, the majority of the participants seem to perceive the various types of exercises available on the platform to be quite useful and they generally have a positive opinion of the resource center, which answers our 2nd research question (do they perceive the activities as useful for their language learning?). However, these results are limited in scope because of the small number of students actually using the VRC and because of the fact we also noticed that a significant number of students who perceived the VRC as useful did not use it. This shows that our results may be biased by the fact that even though a large number of respondents did not use the center, they still commented on its effectiveness, which is the main limit to this study. We did however note a virtuous cycle by which the more they use a section, the more they perceive it as useful for learning and the more they are convinced that they did indeed learn more. These findings invalidate our hypothesis that if students perceive the activities as being useful for language learning, then they will engage in the VRC. 50Our results concerning learning outcomes and their relation with the VRC remain inconclusive (RQ3). On the one hand, we found no statistically significant link between use of the VRC and performance improvements between the pre and post-test. On the other hand, findings of the study indicated some positive evidence of learning instances where the learners were able to independently recall and use language items after they were prompted to practice them on the VRC as part of their pre-task activities. A way forward may be to integrate the VRC more tightly into task objectives so that students see the tool as essential to successful task performance, which in turn may foster engagement. 51Our study also shows that if students use the center and perceive it as being useful, they are likely to be convinced they have learned which could have a positive effect on actual measurable learning outcomes. This study shows that there is a much more complex relationship between perceptions and actions and that even when students claim to perceive tools as relevant this does not necessarily lead to increased engagement. These results bring us back to the drawing board to discuss how we can encourage students to take the next step and spend more time using the resources available to them in order to increase their investment in individualized learning opportunities online. 52Our future developments have a twofold focus. We will address the weaknesses that lie within the VRC itself and improve the types of activities that we offer as well as focusing on fostering student engagement in the VRC. 53Fostering student engagement is the main task we have set for ourselves. Given that the questionnaire results showed that over half of the respondents did not use the center, because it didn't occur to them or because they preferred to focus on the required course work, we will focus our efforts on integrating the VRC into the task-based curriculum. Many of the exercises can be used for pre-task activities in and outside of the classroom. Once students become familiar with the VRC for task preparation purposes, we hope they will continue to use it to work on their individual problems post-task. 54Concerning the development of the VRC, before including more exercises, we would like to expand the entries in the "grammar" explanations section and modify the approach used. A data-driven learning approach ("DDL", Johns 1991) would help learners to acquire language by discovering the patterns of the language use themselves instead of trying to apply rules that are explained to them. This approach is coherent with socio-constructivist and connectionist accounts of second language acquisition. 55This contribution has sought to explore student engagement in and satisfaction with a virtual resource center set up as an integral component of a task-based program for Business English in the Foreign Languages and International Trade program at the University of Nantes. The results of our study have been linked to language learning, a notion which has been clearly distinguished from the notions of success and failure in the academic system. We have shown that this relation is both complex and ambiguous. Our hypothesis that positive perceptions of the resource center would lead to increased engagement was invalidated. The results show that even when students claim to perceive tools as relevant this does not necessarily lead to increased engagement. However, they do show the converse: that increased engagement leads to increased perceptions of relevancy and of language progression which may be pivotal for actual language acquisition and potential success in language studies at the university level. 56Further research will focus on the development of the VRC, on raising students' awareness of the center, on fostering student autonomy, and on evaluating the impact of the use of the VRC on students' accuracy. Baddeley, A. D. 2010. “Learning”. In Baddeley, A.D., M.W. Eysenck & M.C. Anderson (Eds.). Memory. New York: Psychology Press, 69-92. Bertin, J.-C., P. Gravé & J.-P. Narcy-Combes. 2010. Second Language Distance Learning and Teaching. New York: Information Science Reference. Bertin, J.-C. & J.-P. Narcy-Combes. 2012. "Tutoring at a distance: modelling as a tool". Computer Assisted Language Learning, 25/2: 111–127. Bruner, J. 2000. Culture et modes de pensée: l'esprit humain dans ses oeuvres. Paris : Retz. Buck-Roots, J. 2005. Le scénario comme démarche d’apprentissage et mode d’évaluation. Thèse de doctorat soutenue à l’Université de Nantes. Buck, J. & J. McAllister. 2011. « Mise en place d'un dispositif d'apprentissage hybride à l'université ». Les Cahiers de l'APLIUT, 30/1 : 83-101. Bygate, P. Skehan & M. Swain M. 2001. Researching Pedagogic Tasks Second Language Learning, Teaching and Testing. Harlow: Pearson Longman. Council of Europe. 2001. Common European framework of Reference for Languages: Learning, Teaching, Assessment (CEFR). Strasbourg: Conseil de l’Europe. Docq, F. & A. Daele. 2003. « De l'outil à l'instrument : des usages en émergence ». In Charlier, B. & D. Peraya (dirs.). Technologie et innovation en pédagogie. Dispositifs innovants de formation pour l'enseignement supérieur. Bruxelles : De Boeck, 113-128. Fischer, R. 2012. “Diversity in learner usage patterns”. In Stockwell, G. (ed.). Computer Assisted Language Learning. Diversity in Research and Practice. Cambridge: Cambridge University Press, 14-32. Foucher, A.-L. & H. Andrianirina. 2007. « Comment les usages réels d’un dispositif d’apprentissage de l’anglais à distance sont-ils perçus par les concepteurs-animateurs du dispositif ? ». Actes de la journée scientifique Rés@tice 2007, 13-14 décembre 2007, Rabah, Maroc. http://www.resatice.org/jour2007 (consulté le 12/03/13). Johns, T. 1991. “From printout to handout: Grammar and vocabulary teaching in the context of data-driven learning”. CALL Austria, 10: 14-34. [Revised version: T. Johns & P. King (eds.). Classroom Concordancing. English Language Research Journal, 4: 27-45]. MacWhinney, B. 2008. “A Unified Model”. In P. Robinson & N. Ellis (eds.). Handbook of Cognitive Linguistics and Second Language Acquisition. New York: Routledge, 341-371. McAllister, J. 2013. « Évaluation d’un dispositif hybride d’apprentissage de l’anglais en milieu universitaire : potentialités et enjeux pour l’acquisition d’une L2 ». Thèse de doctorat, Université de Nantes. McAllister, J., M.-F. Narcy-Combes & R. Starkey-Perret. 2012. “Language teachers' perceptions of a task-based learning programme in a French university”. In Shehadeh, A. & C.A. Coombe (eds.). Task-Based Language Teaching in Foreign Language Contexts: Research and Implementation. Amsterdam: John Benjamins Publishing, 313–342. Moscovici, S. 1961. La psychanalyse, son image et son public. Paris : Presses Universitaires de France. Narcy-Combes, M.-F. & J. McAllister. 2011. “Evaluation of a blended language learning environment in a French university and its effects on second language acquisition”. Asp, 59 : 115-138. Rokeach, M. 1968. Beliefs, Attitudes, and Values: A Theory of Organization and Change. San Francisco: JosseyBass. Robinson, P. 2002. Individual Differences and Instructed Language Learning. Amsterdam: John Benjamins Publishing Company. Schmidt, R. 2001. “Attention”. In Robinson, P. (Ed.). Cognition and Second Language Instruction. Cambridge: Cambridge University Press, 3-32. Schutz P.A & R. Pekrun (Eds). 2007. “Emotion in education”. Educational Psychology Series, Vol 5. London: Elsevier Academic Press. Skehan, P. 1991. "Individual differences in second language learning". Studies in Second Language Acquisition, 13/2: 275-298. Starkey-Perret, R., M.-F. Narcy-Combes, & J. McAllister. 2012. « Représentations des enseignants d’anglais et évaluation d’un dispositif hybride : image de soi, image de l’apprenant et appropriation du dispositif ». Les cahiers de l’APLIUT, 31/1 : 74 -96. Swain, M. 2000. “The output hypothesis and beyond; mediating acquisition through collaborative dialogue”. In Lantolf, J. (ed. ), Sociocultural Theory and Second Languague Learning. Oxford: Oxford University Press, 97-114. Ur, P. 2004. A Course in Language Teaching: Practice and Theory. Cambridge: Cambridge University Press. Willis, J. 2009. “The TBL framework: The task cycle”. In Van den Branden, K., M. Bygate, & J.M. Norris (eds.). Task-Based Language Teaching: A Reader. Amsterdam: John Benjamins, 227-242. Willis, D. & J. Willis. 2007. Doing Tasked-based Teaching. Oxford: Oxford University Press. Wolf, M. 1978. "Social validity: the case for subjective measurement". Journal of Applied Behavior Analysis, 11/2: 203-214. The aim of this questionnaire is to better understand your use of and satisfaction with the Virtual Resource Center on Madoc. Your responses will help us improve the online English learning tools at your disposal. It will take you 5 minutes to fill out this questionnaire. - less than 30 min. 1 This brings up notions of student autonomy and responsibility that do not fall within the scope of the present paper. 2 An “action” in Moodle can be a simple “view” of an activity or an “attempt” to respond to one exercise. Rebecca Starkey-Perret, Julie McAllister, Sophie Belan et Thi Phuong Le Ngo, « Assessing undergraduate student engagement in a virtual resource center », Recherche et pratiques pédagogiques en langues de spécialité, Vol. XXXIV N° 2 | 2015, pagination en cours. Rebecca Starkey-Perret is an associate professor of the department of Foreign Languages and International Trade (LEA) at the University of Nantes. Her research themes include teacher and student representations, plurilingualism, task-based language learning and CALL. Julie McAllister is an associate professor of the department of Foreign Languages and International Trade (LEA) at the Sorbonne Nouvelle Paris 3 University. Her research interests include technology-mediated language learning and evaluation, second language acquisition and task-based language learning and teaching. Sophie Belan is an associate professor and coordinator of the department of Foreign Languages and International Trade (LEA) at the University of Nantes. Her research focuses on task-based learning, blended learning and CALL. Thi Phuong Le Ngo is a PhD student in English teaching at the University of Nantes. Her doctoral thesis focuses on the development and evaluation the virtual resource center for the Business English program for first-year students. Before coming to Nantes, she was a teacher of English at the National University of Vietnam.